The Visible Legacy Navigator presents the timeline of innovation through the collaboration of organizations of people working on projects. Use Navigator maps and profiles to show what your organization is known for. 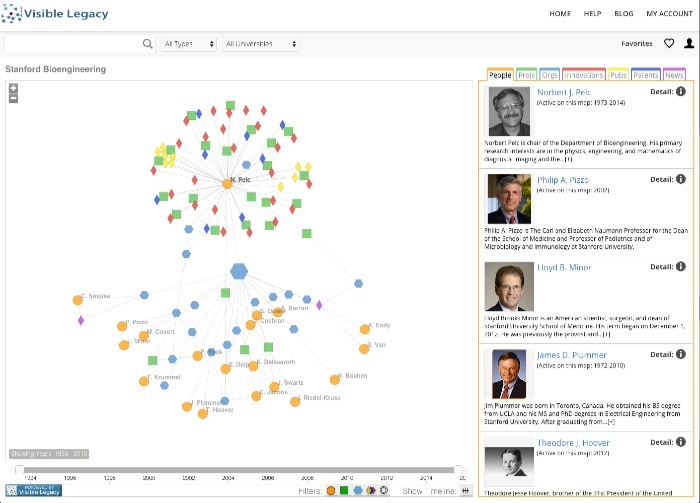 Organizations are mapped automatically from public online sources. Contact us to expedite the mapping of your organization. Use our Advanced Search for a person or an organization. If you are in the map, you can "claim your page" to select featured works and website destinations for Visible Legacy Navigator. Learn how to Claim your Page. No time to check? We'll map you. For a limited time we're expediting researchers and labs in the Stanford community. If you have a stanford.edu email, just use the Contact Us form with "add me!" in the subject. We'll map you and send the link to your map. The Visible Legacy Detail Page shows the context of people, projects, featured works.